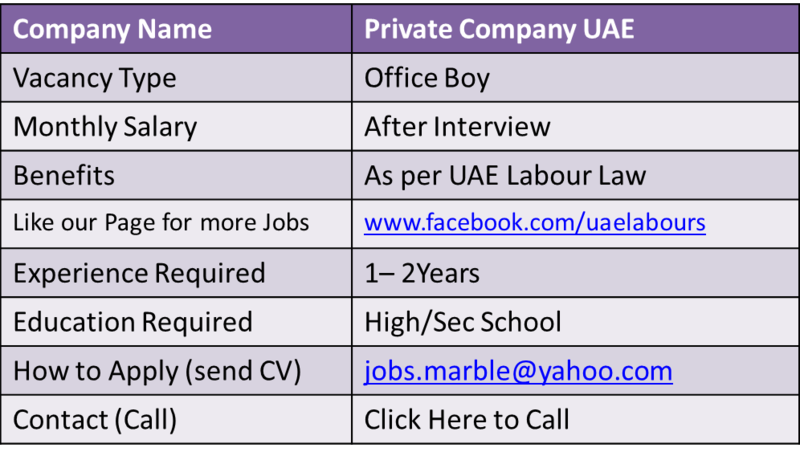 Office Boy jobs are the mostly demanded position in UAE. 1. Serving refreshments (tea, coffee, water, etc) to management and visitors. 2. Maintaining cleanliness and orderliness of office. 3. Basic office task like filing and photocopying. 4. Conversant in English is required. 5. Other task as required by the management. Please, send only your CV if you want to work in SAIF Zone Area. Job Location: Company is located in Sharjah, UAE. If you have the skills and experience which is required for Office Boy position, please forward your resume to below Email Address, or through provided Contact Number Shortlisted Candidates will receive confirmation email.